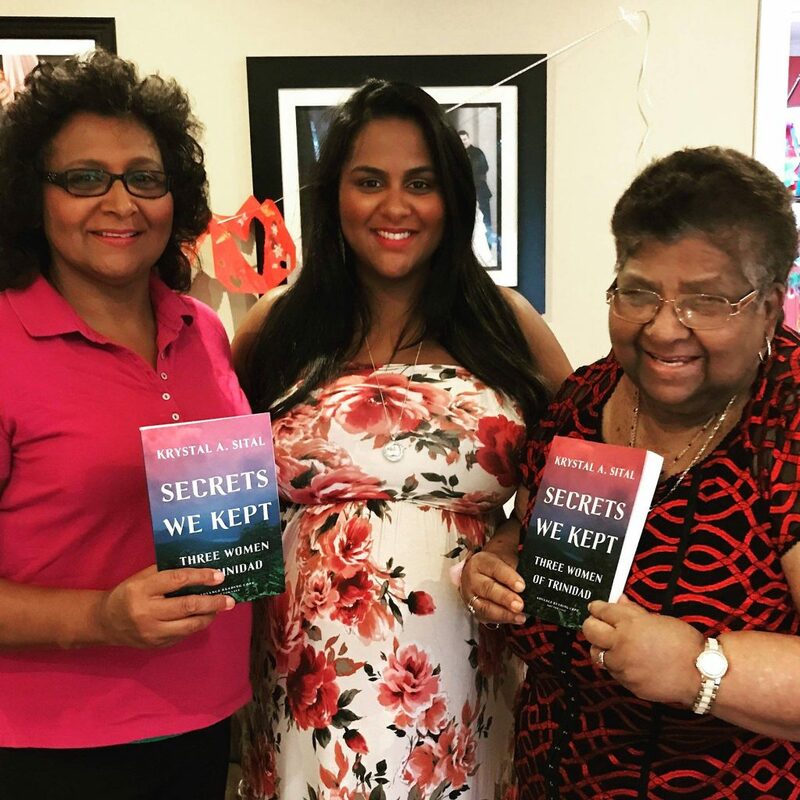 There are many near deaths in Krystal A. Sital’s memoir Secrets We Kept: Three Women of Trinidad – her grandfather’s almost immediately fatal aneurysm, her mother’s car crash as a rebelling teen, her father’s suicide attempt during her parents’ courtship, her grandmother’s close calls after numerous, vicious beatings. While death is at the center of this book, its core is survival and bearing witness to it. Sital, who was born in Trinidad and immigrated to New Jersey in the USA as a child, recounts the personal histories of her mother, Arya, and her grandmother, Rebecca, as they came of age and searched for freedom and escape from poverty, patriarchy, and, ultimately, the island itself. The illness of her grandfather, Shiva Singh, that opens the memoir spurs Sital to probe this history as she notices Rebecca’s hesitation to authorize the medical procedures necessary to keep him alive. One night, while Arya cooks up a storm in their Jersey City apartment, Sital asks the right question and her mother’s stories come pouring out. What Sital learns is that the image she has had from childhood of Shiva – she his favorite grandchild and he someone she considered her “protector”– was a dark farce. In reality, her grandfather was a danger to his entire family, and most dangerous to his wife, who he physically abused with such frequency and brutality that Sital’s accounts are grotesque in their retelling. Arya relates the stories of her childhood and adolescence. She endures beatings from her father, like all of her siblings do, as well as his unpredictable, changeable moods. Through it all, she attempts to avoid a fate as a battered wife, as so many women in Trinidad become, by doggedly pursuing work and education, even when the odds are stacked against her due to the family’s poverty and isolation from the island’s main cities. Much of the memoir is devoted to Arya’s story, through which tales of her own mother’s history echo. Arya does not want to end up married to a man like Shiva, who is both cruel and unfaithful, fathering a child with another woman. She does not want to flee poverty only to end up in a slightly less grinding variety of it. Yet the choices Arya makes in her own life nonetheless mirror the choices Rebecca made – she jumps into marriage with a man she does not truly know and she hopes that the promise of greater material wealth will fill any void left by lack of mutual love and respect. The author, center, with her mother and grandmother. Image via Facebook. In the island world Sital reconstructs for the readers, it seems that those choices are replicated by striving women across generations because there are few, if any, other choices available. Perhaps, then, it is chance and luck that separates the two women? One woman saddled with a sociopathic abuser, the other with a comparatively tame cheater and neglecter. It is not chance alone that determines the difference between Arya and Rebecca’s lives, though. As the Singh and Sital families’ culturally varied names may hint, there are powerful social factors at play that Sital reflects on. While this memoir is largely about patriarchy and misogyny keeping women down, it is also about how racial hierarchy directs and enforces patriarchal oppression in the Trinidad of her mother and grandmother’s lifetimes. Sital’s heritage is a mixed one, starting with Rebecca, a child of Venezuelan and Indian Muslim parents. Such a union was taboo at the time, and her family’s ostracization was a cause of their intense poverty. That deprivation led to an aspiration for, in Rebecca’s words, “house, lan, and motocah.” Those were all things Shiva could offer her. However, in exchange she was forced to tolerate both the violence of her partner and his family, who, she tells Sital, hated her because “they tawt I was black.” In the racial hierarchy of Trinidad, people of African descent were at the bottom while Indians saw themselves as superior. As an added insult, Shiva, proud Indian Hindu thath he was, would never formally marry Rebecca, keeping her as a common-law wife for the entirety of their lives. Arya, on the other hand, with an Indian name and an obviously Indian father, was able to pass into the higher levels of racial stratification on the island, was able to form a union with an Indian man that was both socially acceptable and sanctioned by her family. Did the ostensible racial homogeneity of her marriage influence the voice and greater sense of power Arya was able to have? Sital does not say so explicitly, but the issue of race is one that runs deep throughout the women’s lives. After exploring the lives of her family, Sital circles back to her own conflicted feelings about Shiva as his condition worsens. How does she square all her experiences of tenderness and fun with her grandfather with what she now knows about his past behavior? Ultimately, her uncertainty resolves itself into anger and disavowal. She does not go to his funeral, reflecting she would rather be in class than “roiling in my seat at his funeral while speeches are made about how perfect my grandfather was.” She insists that, had she been given the opportunity to write his eulogy, she would have “told the truth” about him to all present. Research has been done interrogating the effects of domestic abuse and intimate partner violence on the life outcomes of children directly exposed to it – such a child witnessing their father abusing their mother. For instance, a study in the Journal of Interpersonal Violence showed that young adult women directly exposed to “exposed to father-mother-perpetrated domestic violence during childhood and adolescence” had a higher risk of experiencing dating violence in high school; the women’s childhood memories of violence within their own family also influenced how they navigated romantic partnerships into adulthood. However, for those who stand a degree removed from such violence, like Sital, the outcomes, and the guideposts to coping, are fuzzier. Many women who have lived adjacent to abusers in their own families, particularly within South Asian communities where the silencing of abused women is pervasive, go through similar situations of learning of their loved ones’ violent histories after the fact, or having to contextualize this abuse in a larger picture of a person they once knew as affectionate, or friendly, or kindhearted. Can learning about a legacy of trauma be a trauma of its own? How does someone carry forth that knowledge into their future relationships with others? How does it affect their ability to trust, to love, to live? In Secrets We Kept, Sital is able to learn, process, and move on. She is even, as she reflected in a recent interview, able to find “been able to find love; respectful, honorable, egalitarian love.” Other women like her, and her mother, and her grandmother, may not have reached the same stage of their lives, yet, but Sital’s family history is a brave, necessary reminder that they are not alone in their struggles toward freedom, justice, and love.